You may have heard of matched betting from friends or family or have seen advertisements and mentions across the web but what is matched betting and how can you make money from it? Matched betting is a method of turning free bets into real cash. Online bookmakers often hand out free bets to new customers when they sign up and place their first bet. This is a common incentive offered by bookmakers to attract new customers. It works for the bookies as they gain a new customer and it works for the customer as they get a free bet. Bookmakers also run regular promotions for existing customers as a way to keep them coming back and betting more. Usually, in order to receive a free bet when you sign up to a bookmaker, you are required to place a bet with your own money first. A regular punter may sign up to a bookmaker, place their first bet and hope that it wins. Either way, they will receive a free bet for doing so and then they would place that free bet on something else and hope that their bet wins again. They may get lucky and win both bets but they may also lose both bets which would leave them out of pocket. Matched betting works differently to this as even if you lose your bets, you end up with a profit. With matched betting, you cover all outcomes of your bet and use the value of the free bet to return an overall profit. Confused? Don’t be. Keep reading. Let’s say that a bookmaker offers you a £10 free bet when you place your first bet of £10 with them. In order to reduce the risk of losing our bet, we cover all outcomes. We do this by betting on the opposite of our bet on a betting exchange. For example, we may place a £10 bet on Manchester United to beat Liverpool. To cover all outcomes, we would also place a bet on Manchester United NOT to beat Liverpool. These types of bets are called ‘lay bets’ and re when you are betting against something to happen. In this case, if we placed a lay bet on Manchester United, we are betting on them to either win or draw. Therefore, if Manchester United win, our bet with the bookmaker wins and if they don’t win (lose or draw), our bet with the betting exchange wins. We won’t make a profit by doing this and the same is to simply break even or to lose as little as possible. However, by placing this bet, we will have qualified for a £10 free bet and it is from this that we will make a profit. We have now received a free bet and it has cost us nothing (in reality, you may lose a very small amount due to exchange commissions). We simply repeat the process of placing our free bet on an event and laying our bet on the betting exchange. As we are using a free bet this time rather than our own money, we are able to return a profit whether our bets win or lose! There are hundreds of these types of bet offers around and more added on a daily basis. The opportunity to be able to make money from matched betting on a daily basis is what is most appealing to most people along with the fact all profits are tax-free! No-Risk Matched Betting. Is it really risk-free? You’ve probably heard from people who do matched betting that it is risk-free. Mathematically it is but there are some important things to take into consideration before starting matched betting as technically, there are some risks involved. With matched betting, like any betting in general, you are placing bets using your own money. Although you are minimising any risk by covering all outcomes of your bet, there is the chance that you could make a mistake. For example, you could place a £100 bet instead of a £10 bet or place a bet at odds of 1.8 instead of 2.8. Mistakes can cost you money which is why it’s hugely important to read and learn as much as you can before starting. By doing so, you reduce the risk of making a mistake. Odds on bookmaker websites and on betting exchanges fluctuate. There are many reasons why the odds could change such as large sums backing a bet or events such as injuries or the weather. Matched betting involves you placing bets at certain odds in order to make a profit and so if the odds change, your calculations for stake sizes may be off. These can usually be corrected using some handy matched betting tools but it some beginners panic when they realise the odds on a market for which they are placing their bets on have changed. If this happens, don’t panic as it’s likely you’ll be able to adjust your stakes to still return a profit. Don’t hesitate to ask for help from other people also as many have been in this situations many of times themselves and will be more than happy to assist. Yes. Matched betting is 100% legal in the UK for over 18’s and anywhere else where you are allowed to place bets online. If it’s legal and you can make money from it, why do bookmakers allow it? Matched betting is generally frowned upon by bookmakers but that doesn’t mean it’s illegal. The only way matched betting can be stopped is if bookmakers stopped offering free bets and bonuses to customers. As there are so many online bookmakers these days, they’re all competing against each other and offering incentives to new and existing customers is an effective way to increase business. It doesn’t take much to get started with matched betting but there are a few requirements. 1. You must be 18 or over. As you are placing bets online, you must be of a legal age to do so. 2. A starting bank. You will have to have some money to get started with matched betting. It doesn’t take much and you’ll only need enough to cover your first bet offer. We recommend around £100 to be sure but you should be able to get going with around £50 minimum. If you are just starting matched betting, you will have a lot of new customer offers to get through. Each one should make you a profit and so you will see your bank grow quickly. As your bank grows, you can start to do more than one offer at once instead of waiting for your bets to settle and your winnings to reach your bank account before starting the next. Having a larger starting bank will allow you to grow your profits faster but we recommend to start slow until you gain more experience in completing the offers. 3. A bank account. You’ll need a bank account to make deposits and withdrawals from bookmakers. Some people prefer to open up a separate bank account solely for matched betting. The main benefit of this is that you can keep track of how much is going in and out of your account and have a clearer understanding of how much profit you have made. Another benefit is that the deposits and withdrawals that you make won’t affect your everyday lifestyle. It can sometimes take a few days for bookmaker withdrawals to reach your bank account and if you have bills coming out, you want to make sure there are funds available for that. 4. Bet Offers. It would take you all day if you were to search every bookmaker website looking for profitable offers. Thankfully, the team at ProfitSquad.co.uk do this for you and list all offers in the members area each morning for the days ahead so that you can pick & choose which ones you’d like to do and plan ahead so you have time to do them throughout your day. 5. Matched Betting Tools. Now that you’ve found the offers, you need to know how to make a profit from them. ProfitSquad not only frind the offers but also provide you with step-by-step guides on how to profit from them as well as giving you access to matched betting tools which make the process quick and easy. 6. UK resident. It’s not essential that you live in the UK to do matched betting but it does help a lot. The bookmakers we at ProfitSquad provide offers for all accept UK customers and although customers outside of the UK may be eligible to sign up and claim free bet offers, we can’t guarantee it. As mentioned, matched betting works by covering all outcomes of an event, allowing you to return an overall profit from your free bet. There are various different types of bet offers such as free bets, bonuses and money back on loss and all have slightly different methods in order to profit from them. However, the most common offer type you’ll come across are free bets and so we’ll explain below the steps in profiting from these. Profiting from free bets is split into two steps. The aim of this step is not to make a profit but to simply make as little loss as possible in order to receive your free bet as it is with your free bet that you will return an overall profit. However, to receive a free bet, you must place a qualifying bet first. For your qualifying bet you’ll be placing a back bet with the bookmaker and a lay bet on a betting exchange. By doing so, all outcomes are covered. Back Bets – Back bets are betting on something to happen and if you’ve ever placed a bet with a bookmaker before, it would have been a back bet. These are bets such as ‘Liverpool to beat West Ham’ or ‘Over 2 goals in the game’. Lay Bets – Lay bets are betting on something NOT to happen. For example, if you placed a lay bet on Liverpool to beat West Ham, you’d be betting on Liverpool NOT to win. Therefore, your lay bet would win if Liverpool either drew or lost. If you placed a lay bet on ‘Over 2 goals’, you’d be betting on there NOT being over 2 goals and so your lay bet would win if there were 0, 1 or 2 goal scored in the match. When you receive a free bet, you won’t be able to withdraw it. You will have to place your free bet on a market and if it wins, you’ll be able to keep any winnings from the bet. Usually, the free bet is not included in any winnings. The aim of matched betting with your free bet is to turn as much of it into cash as possible. You can then withdraw this cash to your bank account, leaving you with an overall profit. You will back and lay a selection using your free bet but unlike when you placed your qualifying bet, you won’t break even. Instead, you’ll make a profit. This is because you are placing the back bet with the free bet instead of your own money which allows you to spread the value of the free bet across your back and lay bets and return a profit whatever the outcome of your bet. The best way to explain matched betting is through examples, so here is a typical free bet offer you may receive from a bookmaker. In order to receive the £30 free bet, we need to first place a £10 bet with our own money. Remember, the aim of this step is to simply qualify for the free bet with as little loss as possible. You’ll make the smallest qualifying loss when the back odds on the bookmaker and close to the lay odds on the betting exchange. With so many events going on at once, it could take a long time to compare odds manually. Thankfully, the Odds Matcher tool on ProfitSquad finds these ‘close matches’ for you. 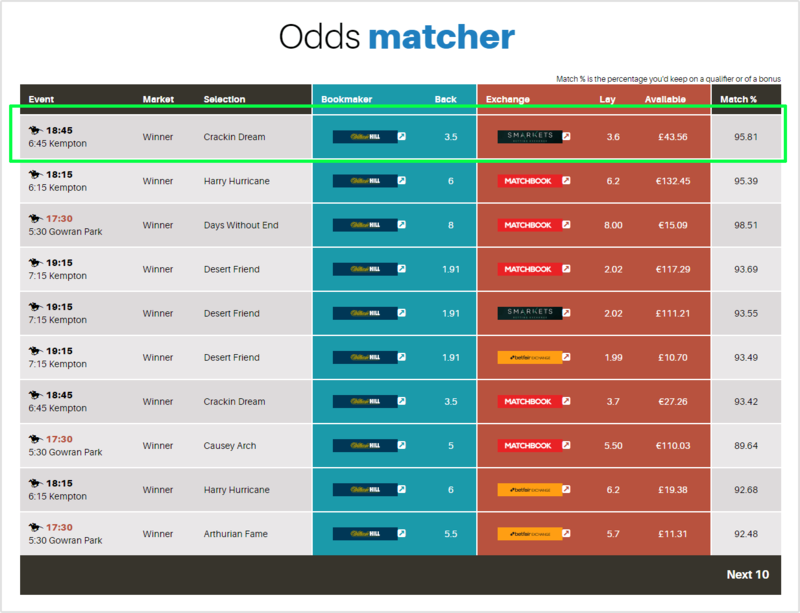 Using the Odds Matcher tool we have found a close match for ‘Crackin Dream’ to win the 6:45 at Kempton. The back odds on William Hill are 3.5 and the lay odds on betting exchange Smarkets are 3.6. We know that the need to place a £10 bet with William Hill in order to qualify for the £30 free bet but to determine our lay stakes we must input the bet details into a matched betting calculator. 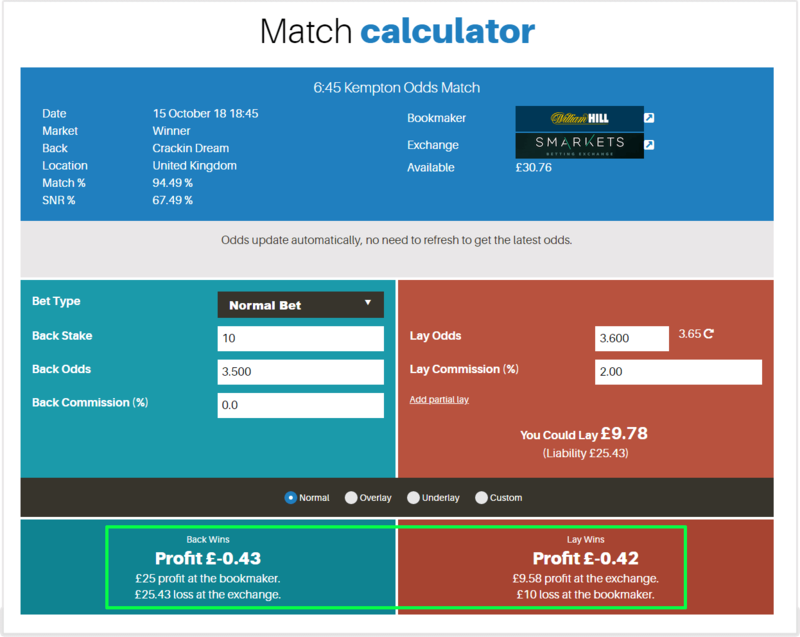 The matched betting calculator shows us that if we place a £10 back bet with William Hill at odds of 3.5, we must place a lay bet with a stake of £9.78 with Smarkets. By doing so, we will make a £0.43 loss if our horse wins and a £0.42 loss if our horse fails to win. However, as we have now placed our first bet of £10, we will receive a £30 free bet from William Hill and all it has cost us is 42p! Now that we have placed our qualifying bet and received our £30 free bet, we need to find another close match to use our free bt on. To do this we will again use the Odds Matcher tool. For our free bet, we have found a close match on ‘Handytalk‘ to win the 8:45 at Kempton. The back odds on William Hill are 7.5 and the lay odds on Betfair Exchange are 7.6. 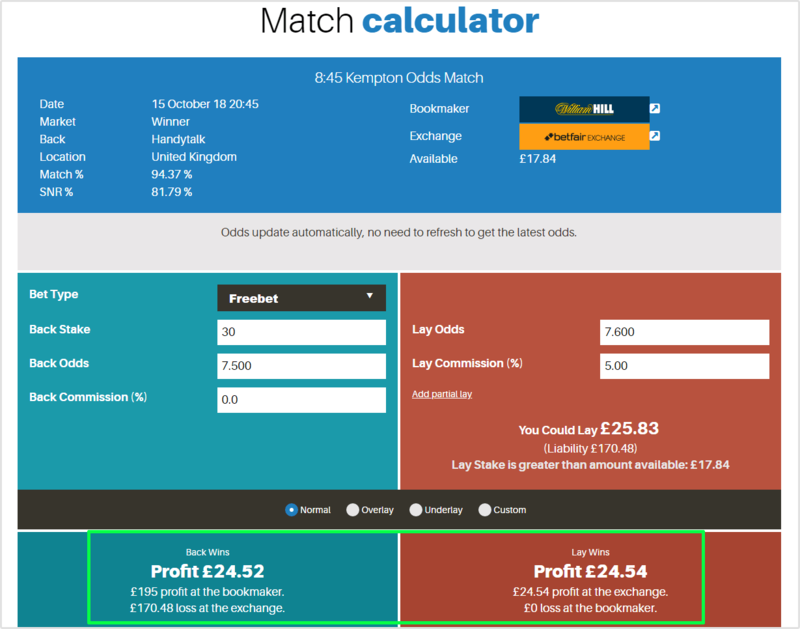 We now need to input the bet details into the matched betting calculator again to calculate our lay stakes and to see how much profit we will make from our free bet. Note: When using a matched betting calculator, there are different settings for qualifying bets and free bets. Remember to select the appropriate one to calculate the correct lay stakes. After inputting the details of our bet and letting the calculator know we are using a free bet, you can see that if we placed our £30 free bet on William Hill at odds of 7.5, we would need to place a lay bet on Betfair Exchange with a stake of £25.83 at odds of 7.6. By doing so, we will make £24.52 profit if our horse wins and £24.54 profit if it doesn’t win! Let’s see how much we have made from this offer. There are a lot of variables when determining how much money you can make from matched betting. For example, some offers allow you to stake as much as you like. With these offers, you are able to return larger profits but you must also have a larger bank in order to do so. There are a lot of available offers from which you are able to make a profit and so the time you dedicate to matched betting will also have an effect on how much profit you can make. That said, one of the most appealing things about matched betting is that it is flexible. You can do it as much or as little as you like when you have the time to do so and invest as much or as little of your funds in it. If you are just starting out matched betting then it wouldn’t be unreasonable to say you could make £1,000 in your first month. That amount isn’t a guarantee but is around what the initial new customer offers can be worth when matched betting. After you have completed the new customer offers, you will be able to claim the reload offers which are available to existing customers. These too can be extremely profitable and so there should be opportunities every day to make a profit. ProfitSquad is a matched betting service which helps people make money from matched betting. Members have access to hundreds of bookmaker offers as well as step-by-step guides on how to profit from each one of them. As a member, you’ll be able to use our matched betting tools to help you make a profit from the free bet offers quickly and easily and help is always at hand with our dedicated support team and friendly members. You can join ProfitSquad today for as little as £1 which will give you access for 13 days and allow you to learn more about matched betting and get started making a profit with the offers.